I can see the draw in having fun puzzles in the game, but I'm not sure puzzles that rely on the intelligence of the player as opposed to the intelligence of the character are within the spirit of the game. It's akin to asking the player to shift a 500 pound rock to prove that his character can do it. Asking us to solve the puzzle from outside the game has rather ground things to a standstill from a storytelling perspective as well. We have two characters who have an INT score of 18, and one who has an INT score of 19. These should approach a genius level IQ and as such those characters should be the ones doing the solving here. If this puzzle is going to kill a party member every time we try an incorrect answer, the correct answer may be to take a different approach to getting past the front door. I suggested a battering ram in a previous post. It was sort of a joke, but a failed attempt at breaking the door down would most likely not result in the death of any players. Posted on 2016-04-17 at 14:50:07. The way I do the above is simple. For picture puzzles when the answer is wrong using a 20 sided die I subtract the characters Int from 20 and then add the difficulty level of the trap/puzzle and that’s the number needed to detect/get the feeling the answer is actually incorrect. In this case Ulthok’s roll was under the needed number so he had no idea that the answer to the puzzle was wrong before he placed the disc‘s..
On any other puzzles/traps, after discovered, I go by the handbook as to a thief’s percentile die roll modifier. However if not a thief then I use a percentile die roll starting at 10% and then adding the characters Intel to get the percentage number they need to solve correctly the trap. Then rolling percentile dice they have to get under that number, which is possible, but hard for non-thief characters. If anyone has a better way to do picture puzzles let me know I‘m willing to check it out and use it. Posted on 2016-04-17 at 17:19:46. Maybe do the check for each character that had input on the solution. That way each character has a chance to have the "feeling". Would account for everyone's intelligence. Posted on 2016-04-17 at 17:35:10. I admit I have no idea on the puzzle. Two of us got the same answer independently based on identified movement patterns. If that was wrong then the pattern is either really tricky or there is no pattern. Even with a hint of one wrong disk that still leaves 120 possible combinations. Anything I post would just be a guess. Posted on 2016-04-18 at 06:35:38. Is the missing side line on the Eel picture from your cut and paste or is it actually part of the disc? Can the Eel be turned inside the disc so the the missing side line would have been to the right as it shows in the other views? Other than that I am at loss. Posted on 2016-04-18 at 11:29:52. The missing side is due to me copying it from a picture taken straight off the trap book page it came from. So please disregard that missing part. Posted on 2016-04-18 at 14:09:25. Well then the next thing I think I see is that the whale is moving quarter turns, not just flat to flat. There seems to be some line up on the corners. So if you split the flats into two's then we got 16 positions and I count the moves as 5, 7, 7. So the next is what? It could be back down the 5 or up to 9. Odd number counts seem to be the move. Posted on 2016-04-18 at 19:22:37. Posted on 2016-04-18 at 21:51:38. I've numbered each of the locations and translated each animal to a corresponding number - the head, face, or whatever part has a nose was chosen as the number designator. As this appears to be a hand-drawn puzzle, Tann can you confirm that I've translated this correctly? Assuming that I have done it right, I counted spaces clockwise to figure the pattern. I've filled the circle at the bottom in with my answer... but I think it's the same as before? EDIT: I think this is the right answer, guys. In the post, Tann said only 1 disc was wrong. Ulthok placed the goldfish "6 spaces counterclockwise on each row" which would have left it facing... straight up. Seems we got the answer right on Q&A (several times) and wrong in Game. Posted on 2016-04-18 at 22:15:41. Thanks for doing all that. I was going to double check that it was posted as discussed, but I must admit it was much easier just reading your post. Shall we try again with everyone looking at it to "get the feeling?" This is the time when you need a charmed goblin and can say, "put your finger in that hole." Posted on 2016-04-19 at 18:14:04. That is the same pattern that Ody and I came up with. So 3 people have come up with same answer so far. GM: Can you verify that the disks were set according to the pattern Ody posted in the QA thread on the first post of page 330 (same pattern Scnozzle just posted as well)? 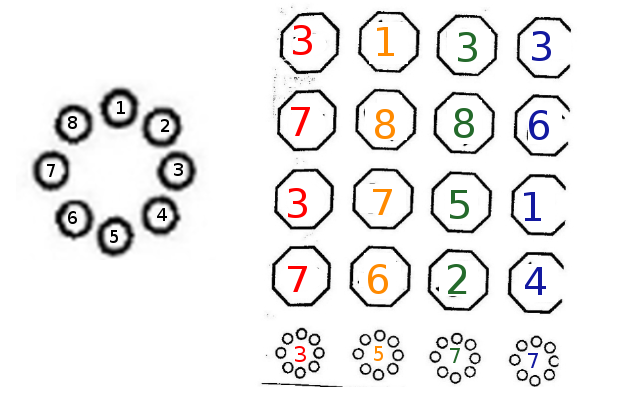 That was the pattern both Cor and Ulthok intended to be entered. If it is not what you thought was set then we have a disconnect between players and GM understanding of the presented answer to the puzzle. Posted on 2016-04-19 at 18:49:14. Are we moving the figure inside the octagon or are we just positioning the octagon? Schnoz, your solution looks the same as what we had. I think the whale is the one that is wrong in our first attempt. Posted on 2016-04-19 at 19:11:32.
tann did Xin find anything in his exploration? Posted on 2016-04-20 at 15:01:53. We have plenty of ways to bring back the dead. Couple of clerics is the easiest method. Posted on 2016-04-20 at 17:58:02. I wonder if we look at the overall pattern we might find another option. The fish are alternating, makes sense. The scorpions form an arc, makes sense. What if either the whales or the snakes form an arc as well. So that the final tile would return to position 3 instead of 7? Posted on 2016-04-20 at 19:34:52.